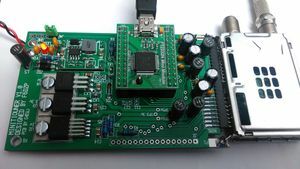 The MiniTiouner hardware, designed by Jean-Pierre F6DZP, is a DVB-S/S2 USB receiver card and measurement tool that works with the software "Minitioune". Version 2 sold by BATC and is the current version described on this page. Sold as an easy to build home construction project with options to add an LCD display and simultaneously decode a 2nd channel. MiniTioune-Express is sold by the DATVexpress team as a ready built unit. It does not have the option for LCD or 2nd channel decode. The BATC Minitiouner hardware is designed for home construction and consists of the 3 main components described on this wiki page. The ready programmed USB interface. The version 2 main PCB. 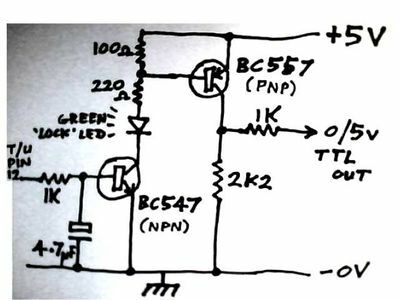 The hard to find MCP1826 1v regulator. All other components such as Rs and Cs are available from normal suppliers and the 5v switched regulator module is available from ebay. A parts list for the version 2 PCB is available on the V2 wiki page and can be used to order all other parts directly from Digikey. Total project cost using new parts and including a nice Hammond enclosure is around £85. New builders should go to this MiniTiouner hardware Version 2 wiki page for more details, part list and construction tips. There are 2 variants of the MiniTiouner main PCB which contains the power supply components for the 5, 3.3 and 1 volt rails. As from April 2017 ONLY the version 2 PCB designed by Mike G0MJW is available from the BATC - new builders should use this version which takes the wide coverage Serit Tuner enabling coverage from 140 - 2500 MHz without any external upconverters. Version 1 was the original PCB designed by Brian G4EWJ and sold in the BATC shop until early 2017 - this board is no longer available and new builders should only read the version 2 build documentation. See this MiniTiouner hardware Version 1 wiki page for details. The MiniTioune receive hardware is connected to a Windows PC running the MinITiouner software over a standard USB 2.0 port. 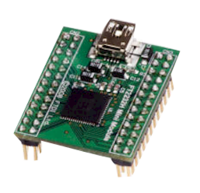 The pre-programmed USB module available from the BATC shop acts as a 2 channel USB converter between the PC USB port and the NIM. One channel is used for control and monitoring and the other carries the Transport stream data from the NIM. If you buy a USB module from another source (not the BATC Shop) and need to program it, the instructions are here http://www.vivadatv.org/viewtopic.php?f=80&t=379. Note - some people have noticed what appears to be a solder short between 2 pins on the IC on the USB module - see below - this is perfectly normal. The NIM or Network interface module is the little metal box found inside Satellite Receivers (also called the tuner) and typically contains 2 chips : the Zero Tuner and the Demodulator. RF Signal is sent to the antenna connector "RF input", it is amplified by a transistor "booster", the zero tuner selects the frequency asked and the demodulator extracts the data (Transport Stream) that goes outside the NIM on a digital parallel output. The BATC shop used to sell a Sharp and Eardetek NIM with frequency coverage from 650 MHz through to 2600 MHz and so need an upconverter to receive 146 and 437 MHz. As of February 2017 the Sharp and Samsung tuners are no longer available and the project now uses a NIM tuner from Serit which covers from 143.75 MHz right through to 2450 MHz without the need for any upconverters. This extended frequency coverage gives greater flexibility and means up converters from the VHF and UHF bands are not required and enables the 10 GHz band, including Es'HailSat-2 down link, to be received on a standard domestic PLL LNB. 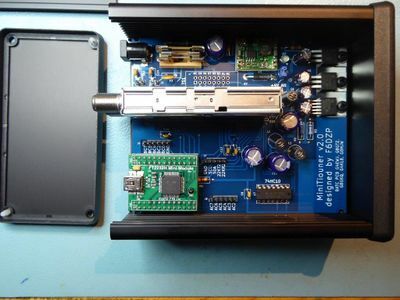 This makes building a receiver for 146 or 437 much easier, although you will need a pre-amp followed by lots of filtering for each band - take a look at the picture on this page if you want to know why! However, due to a different pinouts from the Sharp NIM, the Serit NIM tuner will also need a simple adapter board to enable it to be plugged in to the Version 1 MiniTiouner hardware - Brian G4EWJ has designed a board and these are available from the BATC shop. The adapter board and the Serit FTS4335 NIM tuner are available from the BATC shop. Full details of this board and using the tuner are available here. Note: You only require the adaptor PCB if you are upgrading existing MiniTiouner hardware to include the Serit tuner. Check this page to work out if you should upgrade. When Minitiouner is used at repeater site a lock detector is required to tell the repeater logic when a signal is being received. Several designs based around the NE567 have been used but the simplest and most reliable is from Robin, G8DRK. 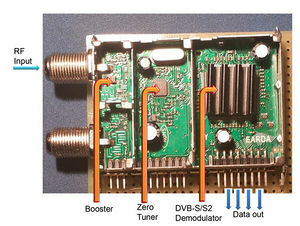 The 22kHz from the tuner is coming from a 3.3V port which is normally zero volts. When it outputs the 22kHz tone it does it by pulsing up to +3.3 volts with a 50% duty cycle. So we can simply smooth that and get about 1.6 volts - more than enough to turn a transistor on. 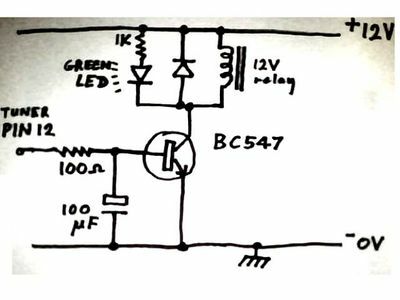 This circuit should drive most small 12 volt "signal" relays. If relay needs more than 90mA consider using a smaller one or try a beefier transistor but with a gain of at least 100. In both circuits the green LED functions as a Lock-LED, as long as you set "22kHz_switch=2" in the MiniTioune.ini file. This page was last modified on 17 April 2018, at 11:08.